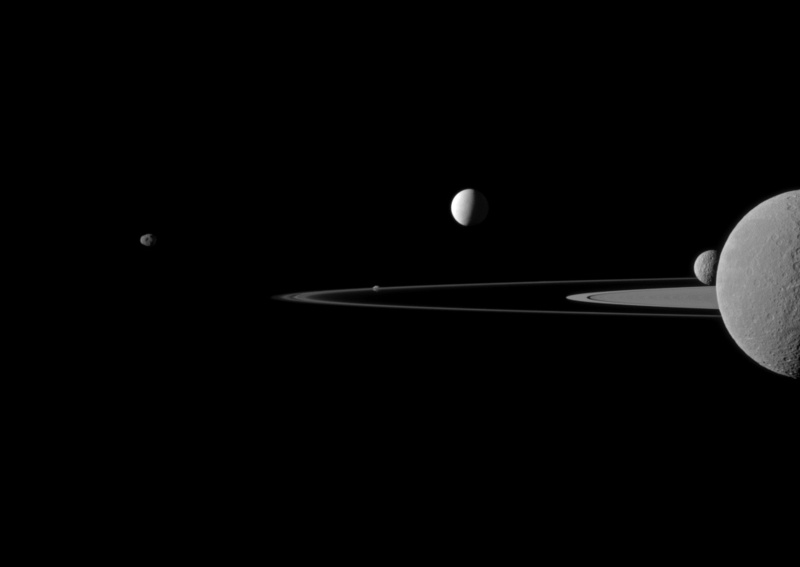 From left to right that’s Janus, Pandora (in the rings), Enceladus, Mimas, and Rhea. Perspective plays a role here; Rhea is three times bigger than Enceladus, but was much closer to Cassini when this picture was taken, so it looks even bigger. But the moons themselves are so different from each other! Janus is a lump, too small to have enough gravity to crush itself into a sphere. Enceladus is mostly ice, so it appears very bright in this image compared to its rocky siblings. You can just barely see part of the monster crater Herschel peeking out of the dark side of Mimas, while Rhea is peppered with smaller craters. And Pandora orbits inside Saturn’s rings themselves, its meager gravity enough to entrain the particles in the thin F ring and keep it in place. And, of course, the rings themselves, composed of countless tiny ice crystals. Over millions of years, collisions have ground them into pieces ranging in size from barely big enough to see to perhaps 10 meters across, the volume of a roomy two-car garage. Amazing. And this vista was taken just a couple of weeks after Cassini’s seventh anniversary in orbit around Saturn. Even after all that time, and tens of thousands of images, it still has the capability to take our breath away.